In fulfillment of an ancient prophecy, Jesus enters Jerusalem riding on a donkey. Crowds of people spread their cloaks in the road and cut branches from trees to spread in his path. The people shouted “Hosanna to the Son of David,” and other cries of praise and blessing. 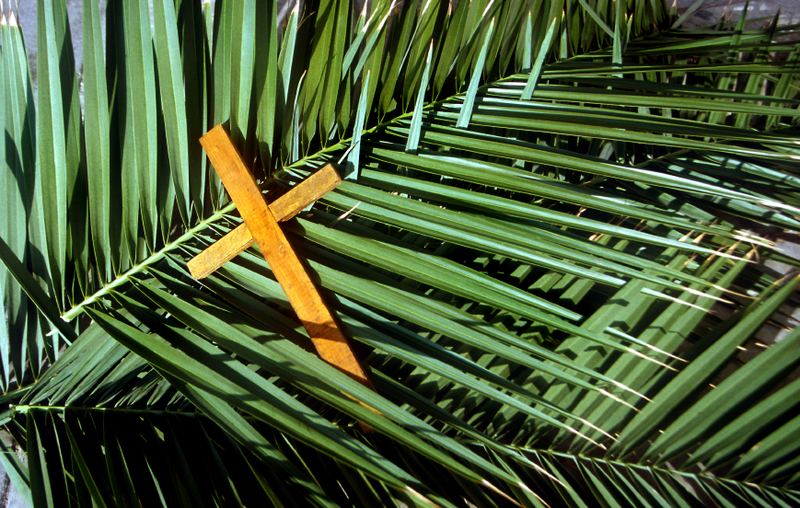 The tension between suffering and glorious triumph is set immediately before us on Palm Sunday. Today’s hosannas ring out even as a sense of foreboding grows. Jesus enters Jerusalem proclaimed as a king, riding toward a destiny of suffering and death amid the shouts of those who soon will turn against him. Who is this riding among us? Jesus, the Prophet of Nazareth. Blessed is he who comes in the name of God. Hosanna, may his Way be victorious. Who is this riding the animal of peace? Jesus, the Prophet of Nazareth. Blessed be the freedom he brings. Hosanna, may his Way be victorious. Who is this carrying the palm of peace? Jesus, the Prophet of Nazareth. Blessed be our leader, the Prince of peace. Hosanna, may his Way be victorious. Who is this that destroys the weapon of war? Jesus, the Prophet of Nazareth. Who is this that frees the oppressed from prison? Jesus, the Prophet of Nazareth. Blessed is he who releases all captives. Hosanna, may his Way be victorious. Who is this that makes wars to cease in all the world? Jesus, the Prophet of Nazareth. Blessed is he who restores the Paradise of Eden. Hosanna, may his Way be victorious. This moment of triumph ends quickly as the Liturgy moves to the Passion and the cries of “Hosanna!” become “Crucify him!” The Old Testament and Epistle readings further illuminate the themes of the entry into Jerusalem and set the stage for the Passion itself. As you read the Gospel lesson for the Liturgy of the Palms in Matthew 21:1-11, try to imagine the scene as Jesus enters Jerusalem at the beginning of Holy Week. What kinds of persons today receive similar “red carpet” treatment? What do these choices tell us about the values of our culture? As you listen to the Passion story, choose one of the characters in this drama and imagine the event through his or her eyes. What added insights do you have about what happened? This entry was posted in Feast Days, Holy Week and tagged Gospel of Matthew, Holy Week, Jesus, Palm Sunday, Passion Sunday, prayers. Bookmark the permalink. Pingback: Stuff Catholics Like: Palm Sunday « After the Ecstasy, the Laundry . . .